Instead of mirroring the honesty and transparency of Governor Brown, this afternoon, Supt. 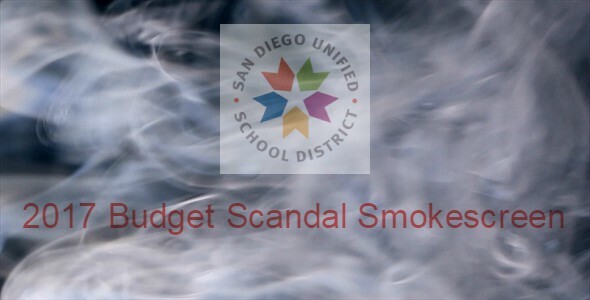 Cindy Marten and Board Trustees Richard Barrera, John Lee Evans, Kevin Beiser, Mike McQuary and Sharon Whitehurst-Payne will attempt to deploy a huge smokescreen to cover up the misery they have inflicted on thousands of SDUSD employees, families, students and community members caused by their gross financial mismanagement. Unfortunately SERP is really just a loss leader to placate the majority of SDUSD employees who got to keep their jobs in this dysfunctional district and a way of avoiding a takeover of the SDUSD for one year while mortgaging the future on the backs of current employees, especially those who provide the most important support services that keep our children safe and healthy. 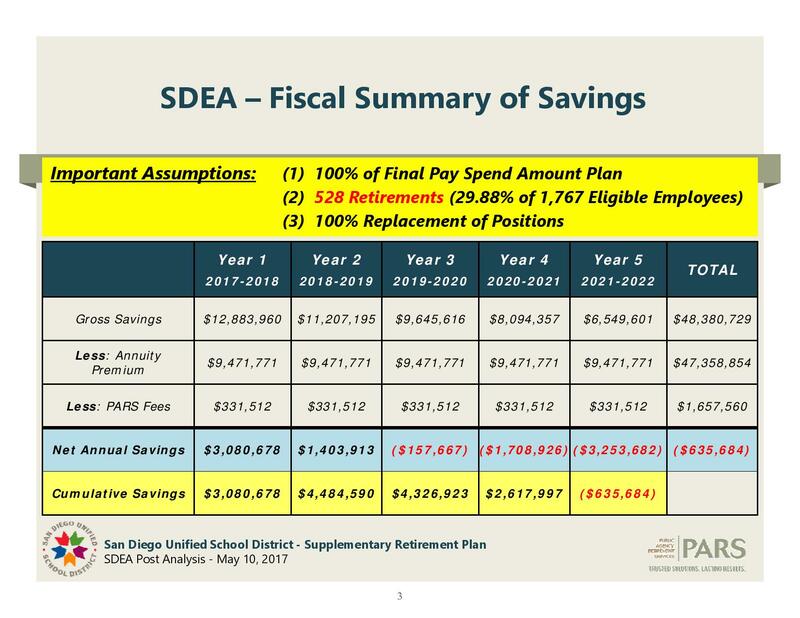 Last week the Board approved the SDEA (Teacher) SERP that begins losing the District money by year 3 and will actually ADD $635,684 MORE to the deficit over 5 years. (see below). Sounds bad…but it gets worse! That’s right…the proposed “budget remedy” by Supt. Marten actually ADDS to the budget deficit disaster from year one…and is magnified to OVER $25 MILLION after 5 years!!! But it gets even worse!!! The SERP as it stands may violate the MOU for all the participating SDUSD employee groups. The wording is identical in each of the bargaining unit MOU’s and according to the SDUSD numbers, the OTBS SERP alone will be OVER $7 MILLION in the red “cumulatively over five years”!!! 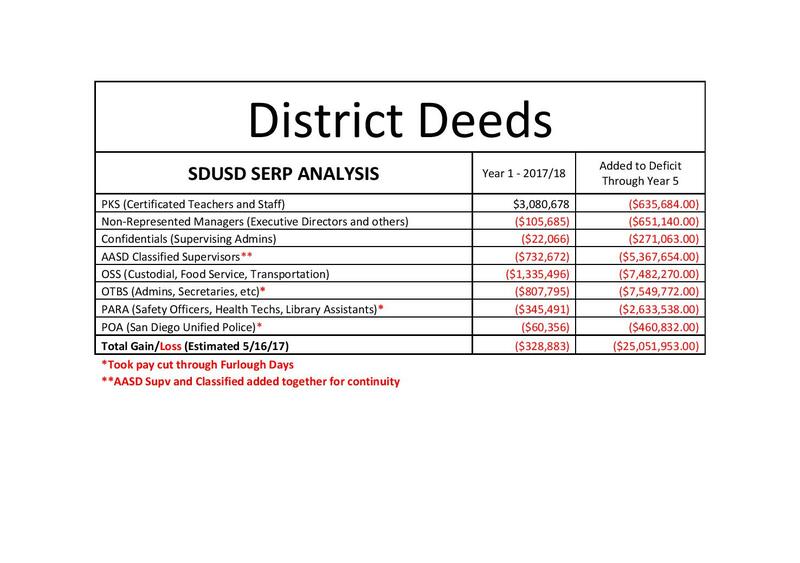 The worst part is that $25 million SERP deficit is “dead money”…money that is paid to employees who will no longer contribute anything to the SDUSD. So what could Supt. Marten and Board Trustees Richard Barrera, John Lee Evans, Kevin Beiser, Mike McQuary and Sharon Whitehurst-Payne be trying trying to cover up tonight? They will attempt to cover up the human resource disaster that will horribly impact the safety and security of our schools for years to come by drastically cutting back all the critical support staff at school sites. With the SERP losing money and no other property to sell or resources to exploit, all that remains to be squandered by Supt Cindy Marten is human capital. 1. Lay off additional classified employees who didn’t agree to furlough days this year including custodians, bus drivers, maintenance personnel and food service workers. 2. Use employee attrition to reduce all staff positons – do not fill any positions for at least the next 2 years. 3. Deploy major lay offs next year for the bargaining units that accepted furlough days. The agreement they accepted locks in pay reduction via furlough days for two years but the protection against layoffs is only one year. It is possible that if we add together the number of employees taking SERP and the layoffs, the number of employee victims departing SDUSD could easily exceed 1,800 current employees, over 10% of current staff, by this time next year!!! Eliminating over 1,800 dedicated, skilled SDUSD employees by implementing the SERP retirements and lay offs is like foreclosing on Grandma and kicking her out of her house!!! So add 1,800 departed employees to the dead money SERP, to the 20% expense increase in CALPRS and CALSTRS fees and the Gov. Brown predicted big” cuts to California State Educational funding, and then blend it with the total incompetence of Supt. Cindy Marten to operationally and financially manage the seventh largest school district in the United States. The result is an ongoing SDUSD management disaster that could damage our SDUSD students, families and employees for years to come. This disaster needs to stop. Cindy Marten has got to go. This board and leadership has GOTTA GO!. What appears to be scene straight out of Office Space. How does SDUSD JUSTIFY now listing JOB OPENINGS while in the process of LAYING OFF Thousands?